With all the latest slot machines and table games, and an exciting Live Casino option, this download only online casino is full of great fun to be had. 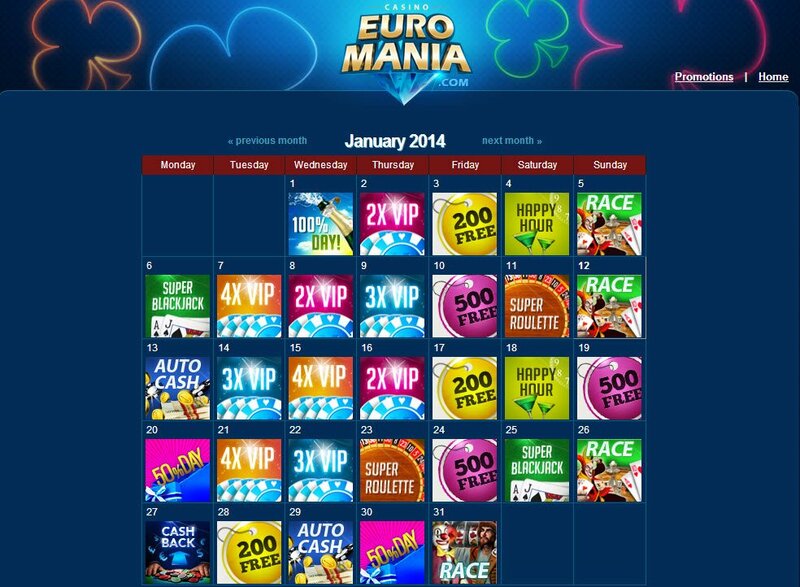 Along with a non-stop promotions calendar that just won’t quit, and a generous welcome offer for new players, there is no reason not to check out EuroMania Casino today. 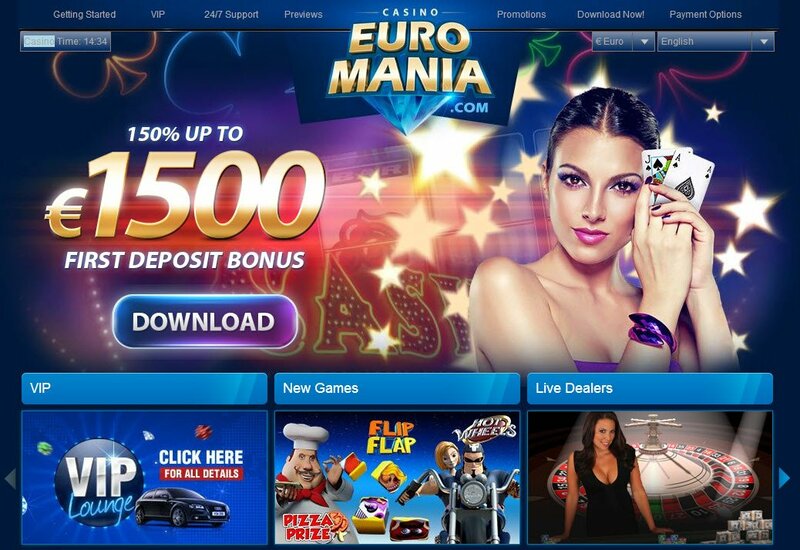 Welcome to the EuroMania Casino review, here to explore the ins and outs of this online casino so you don't have to. 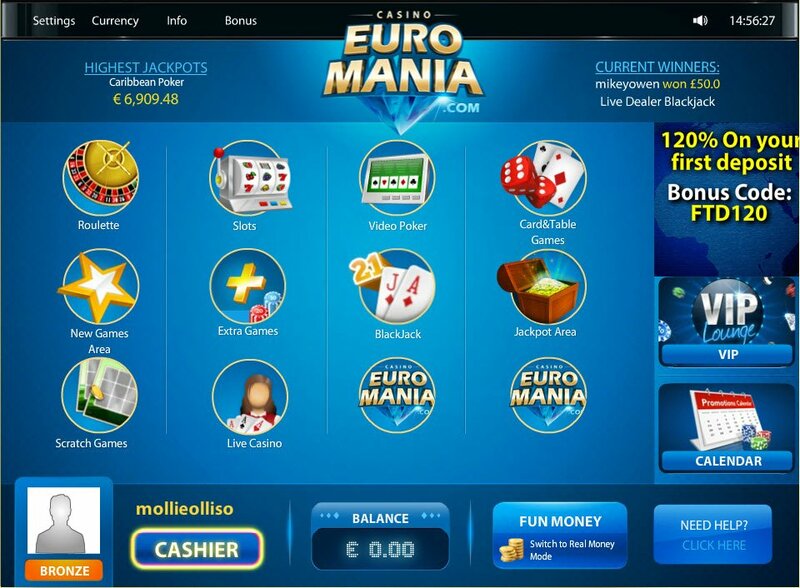 The EuroMania online casino is based in Netherlands Antilles and is available for download only. EuroMania Casino offers a wide range of exciting, graphically intriguing slot machine games and a steady range of table and card games. The casino lobby is a nice blue and everything is organised well, with no crazy flashing pop-ups. It is easy to navigate between the menu list on the left of the lobby, where you can choose from Slots, Blackjack, Card & Table Games, Jackpot Area, New Games Area, Roulette, Video Poker, Extra Games, Scratch Games and the Live Casino. There's Pirates Treasure Hunt Video Slot, Irish Eyes II and all those other innovative video, 3D, 5-reel and 3-reel slots available to play here. The New Games area shows all the newest slot treats and the new Blackjack Turbo, so you can be sure of keeping up with all the latest tweaks and improvements to old favourite table and card games. The weekend EuroMania Casino tournaments, mystery bonuses and raffles are also on the promotions calendar, which gives you a little, or a lot, extra every single day, whatever the weather outside. Buttons to the cashier and customer support and conveniently placed at the bottom of the lobby, for easy access, whilst the VIP lounge and promotions calendar are available to enter on the right hand side. There is a rotating notification at the top of the lobby showing you the current highest jackpots and current winners, along with how much they won and on which game. The current EuroMania Casino welcome bonus is a 150% price match on your first deposit. There are also 2nd, 3rd, 4th and 5th deposit price matches of up to a whopping 200%. There is a Real Kick you just have to get in on, where you can win a place and a share in the winnings on special Mondays and Thursdays., with special bonus codes to help give you a head start. Not to mention the Auto Cash bonus, just as a reward for playing and accumulating points. There are also monthly price match deposit bonuses to be had, including special rates for VIP players and executive matches. Customer support is available on a foreign number and several department specific email addresses 24/7. They advise contacting them via email in English, as other language support is not available round the clock. Surprisingly, there is no Live Chat option, which is disappointing. Emails are, however, replied to in pretty quick time. The amount of different EuroMania Casino payment methods is astounding, there are some that I must admit I haven't heard before (I am going to count on it being the fact they are popular outside of the UK, or English speaking countries). There are the usual suspects, such as Speedcard, Click2Pay, Skrill, Visa, Paysafe Card, Nordea, Neosurf, PugglePay and Swiff, plus the whole host of other countries favourite casino deposit methods. Excellent VIP program at Euromania! Players can win incredible luxury holidays.